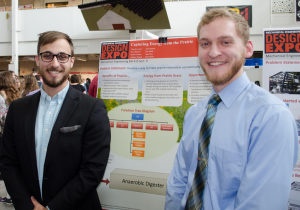 Andrew Hansen (left) and Eric Mach led a senior capstone project in mechanical engineering to design a system for converting prairie grasses into fuels and chemicals. They presented their project at Iowa State’s Mechanical Engineering Design Expo, held on Apr. 26. 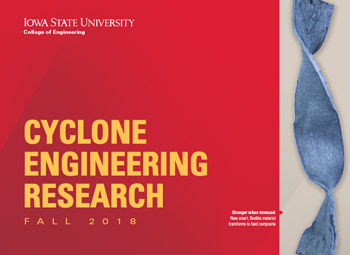 Two teams of mechanical engineering students from Iowa State University have designed a system to convert prairie grasses into fuels and other products as part of their senior capstone project. The effort involved close collaboration with an industrial company, Roeslein Alternative Energy LLC, including a visit by the students to the company’s headquarters in St. Louis. 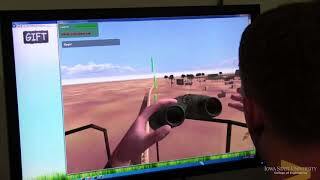 The project was part of ME 415, mechanical systems design. 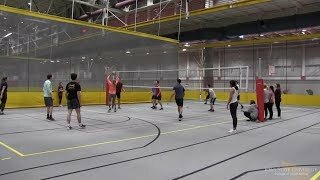 Team leaders were Andrew Hansen and Eric Mach, and members were Theodros Asrat, Peter Batdorf, Daniel Carlson, Arie Hanson, Jajun Ryu, and Nate Steele. The project started out as two separate teams but they soon merged into one because of the sheer scope of the effort required. The course was taught by Jacqulyn Baughman, director of the Biorenewable Resources and Technology (BRT) graduate program at Iowa State. Roeslein Alternative Energy has been working with Iowa State and its Bioeconomy Institute since 2012. The company’s mission is to help individual landowners and society as a whole collaboratively discover and implement alternative biomass and energy solutions. 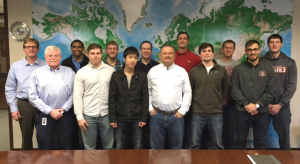 Students in an ISU Capstone project visited the St. Louis offices of Roeslein Alternative Energy LLC to collaborate with the company on technology to convert prairie grass to fuels and other useful products. Left to Right: Chris Roach (Roeslein), Hassan Loutfi (Roeslein), Ted Asrat, Nathan Steele, Andrew Hansen, Jajun Ryu, Tony Smith (Roeslein), Rudi Roeslein (Roeslein), Eric Bancks (Roeslein), Peter Batdorf, Daniel Carlson, Eric Mach, and Aric Hanson. In anaerobic digestion, microorganisms break down biodegradable material in the absence of oxygen. The result is a biogas, akin to natural gas, which can be used as a fuel in internal combustion engines or for heat and power. Materials usually considered waste, such as livestock manure, are often used as the feedstock. The students’ goal was to create a low-cost anaerobic digestion system that uses prairie grass as a feedstock to generate marketable fuels and byproducts. Such a system would provide a source of income from prairies, giving landowners motivation to cultivate and restore prairies. Prairies can serve to reduce erosion and runoff, preserve wildlife habitats, and sequester carbon. The students focused on designing a modular system, the kind in which Roeslein Alternative Energy specializes. 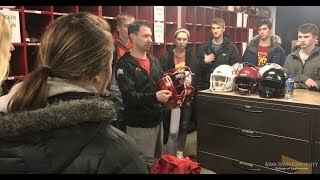 The system can be made in a factory and delivered to a site closer to the prairie, increasing its quality and drastically shortening the time to get the system up and running. In particular, the students came up with a novel design for agitating the digestate, the non-biogas material remaining after the actual anaerobic digestion. This agitation is a key process in students’ system. In addition to biogas, it can produce a liquid that can be used as a fertilizer and a solid component that can be composted and used as a soil conditioner. Student leaders Hansen and Mach said the course drew on all the other engineering courses the students have taken. The project required knowledge of topics ranging from heat transfer to mechanical design. They added that the class helped them realize that engineering consists not simply creating the most optimal design but creating one that is financially viable. Representatives from Roeslein Alternative Energy said the project exceeded their expectations. As well, the students benefited from the exposure to the practice of engineering and methods used in industry. It is hoped the company can use the students’ designs to proceed with further development and detailed engineering of the agitator.